Ideal Location, Charming Home, Spacious with a Full Lap Pool! Traditional Olde Winter Park home ready for your event, special occasion, vacation, wedding, golf weekend, or executive rental. Very close to Rollins, UCF and Full Sail (perfect for graduations and alumni). * Fully Updated Kitchen, granite counter-tops, all Bamboo flooring, Travertine and slate. * Pool, BBQ, 65" Flat Screen TV in main room, Additional Flat screen TV in Master Bedroom, DVD, Cable, Super Fast Internet! * 2 Queen Beds, 2 Full beds w/feather-beds (the best sleep ever!) and linens in each room. One Queen sleeper sofa, and love seat. Seriously, you won't want to get out of bed in the morning! * Open family room and dining room with a view of the pool. Great for entertaining as the dining room table expands to seat 12-16. * Full sized Washer and Dryer. * Less than 3 miles to Park Ave. in Winter Park, 2 miles to Baldwin Park Lake and downtown Orlando. * Blue Jacket Park and Playground 5 blocks away. * Convenient walking and running paths around Baldwin Lake. * East End Market (high end restaurants and boutique shops), ABC liquors, Stardust coffee house, Juniors Diner, Big Daddys Bar, hair salon, sandwich shops, Lolas Sushi, Red Light, Red Light craft beer bar, yoga/spinning and a two hair salons are all walking distance (three blocks). I bought this home over 10 years ago to flip. The market fell apart and I have been on Homeaway since then. I have many regular renters that come year after year. So long term is usually not available unless summer months to make room for wonderful families that have become my family. Quiet family neighborhood. Very secure Winter Park police force patrol. Large open living area for family get togethers, bbq, weddings and events. 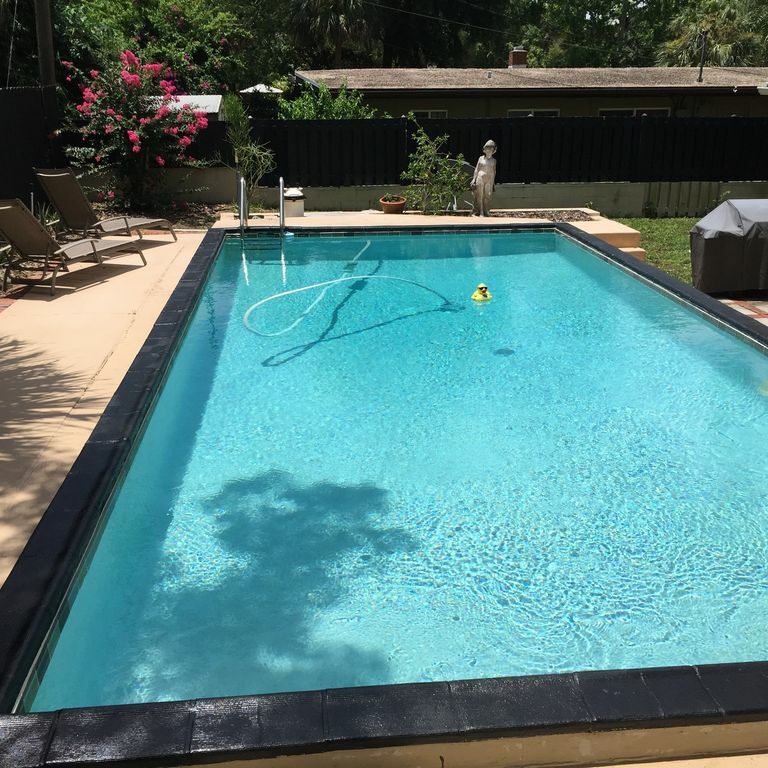 Location, in between Charming Winter Park Park Ave and downtown Orlando. Everything is 5 min or less uber ride. 2 car carport, parking for 6-8 vehicles. Please do not park in yard. Back yard is small due to pool, although all fenced and private. Large front yard corner lot. 2nd Bedroom has small garden patio fence enclosed, lovely for early morning coffee. Charming, incredibly well stocked home in a delightful neighborhood that was just minutes from all the great places in Winter Park. Thanks so much for helping to make our family trip such a memorable one. Great house! Perfect for our family. Clean and the owners were very accommodating. Highly recommend this house. Thank you for the comments. We try to make your visit as comfortable as possible and address any needs promptly. We look forward to your next visit. Thank you we enjoy making the home comfortable so you can relax and enjoy your visit. We enjoyed our stay for Rollins Parents Weekend. The home is very deceiving from the road. Nice and spacious home with lots of doors to the outside. 2 bathrooms for 8 people is a little tight but we made due. Antiques and golf memorabilia are impressive. This was a wonderful home for our family. Plenty of room and privacy for each of us. The pool was an added bonus. This home was located conveniently to theme parks and Winter Park attractions as well. I would highly recommend it! 3 miles to the majestic Winter Park, Rollins College, Park Ave restaurants and shops. We Do not accept Bank Transfers ! Please contact owner for contract to review.